← Binary Search Program in C…!!! Database plays a very important role in maintaining a web site or a organization details.It will be exciting if we are able to use the data present in Database in our program.One of the important features of Java is that we can connect to database using it.Connecting Java to Db is called as Java connectivity.With help of Java connectivity we can retrieve, update the data present in the Database. For connecting the database to the Java program we need to install the drivers.In our tutorial we going to use Microsoft Access as the database.For installing the drivers we need jdbc-odbc files.Jdbc drivers are available with java api kit.Microsoft provides the odbc drivers to the users defaulty…but we need to install them.To install them follow these steps. Step 2: Select administrative tools. Step 3: Select Data Sources(odbc). Step 6: Now give the name of the data source which you are going to use. With this you installed the drivers for connecting the java the to Ms Access. Step 1: specify the rivers which you are going to use in the program.For this we need to invoke a method called as forName() which is present in the class “Class”. Step 2: Now we need to start the connection to the Database.For this we use the method getConnection() which is present in the class DriverManager.Which return an object of connection class.We need to pass the protocol,user id and password for the database.The url consists of three parts protocol,subprotocol,sourcename. Step 3:Now we need to create an statement to execute the queries.For this we use the method createStatement() which is present in the Connection class and we use the con object to call the method,Which returns an object of statement class. Step 4:Now we shall execute the queries on the table.For this we use the method executeQuery() which is present in the class Statement and we use the object st.It returns the set of results of the operation and we need to store them in an object of ResultSet. This entry was posted in Java and tagged how to connect database in java using ms access, how to connect java with ms access database with an example, how to connect jdbc odbc in java, how to connect ms access database in java, java code to connect to ms access database, java ms access connectivity code, jdbc connection code for ms access in java, jdbc connection in java using ms access, jdbc connection in java with ms access, jdbc microsoft access, ms access jdbc connection, ms access jdbc driver. Bookmark the permalink. Pingback: Connecting Java to Mysql Database | letusprogram...!!! 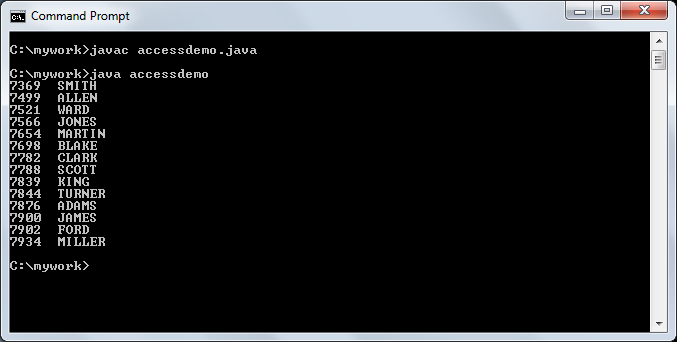 Pingback: Java program for Inserting rows using preparedstatement | letusprogram...!! !